The picture atop this posting is one you might recognize from one of my prior entries here on Blogger, where I discussed Emancipation Day. 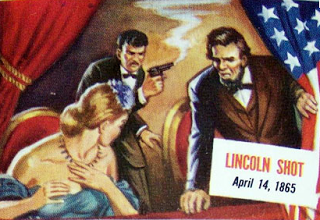 And as you can see, this image includes the date of this horrific event, which occurred on April 14th 1865. In 1865, the date for Good Friday was April 14th, as it is today. And I confess that, even though I'm from "The Land of Lincoln (Illinois)," AND attended an elementary school field trip where I visited his home in Springfield Illinois, I had forgotten that in the year of 1865, April 14th was also Good Friday; as is the case today.